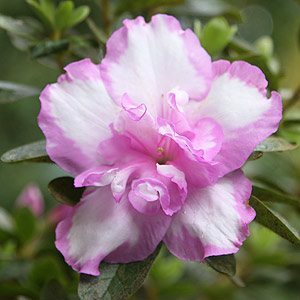 The main varieties of Azalea plants for sale in Australia are the Indica hybrids which require a frost free environment. The other variety are the Kurume hybrids which will handle a colder climate. Both varieties are evergreen. We deal with the deciduous ‘Mollis Azaleas‘ separately. The Indica types are taller growing and can reach around 3.5m, however they are generally kept lower than this. Flowering in winter with large flowers, sometimes doubles the wonderful white flowering ‘Alba magnifica’ is one of the most popular, ‘White bouquet’ is another. The Indica types generally handle a little more sun than others, the warmer the climate the more shade, however filtered shade is best. Indica varieties can also be trained into standards. The Kurume types have smaller foliage and smaller flowers, however they do look great planted in large banks, some fine examples can be seen in Olinda at the Arboretum. These are a more compact and denser growing type than the Indicas and along with the small foliage makes them well suited for use as a border plant or low hedge. We also have different foliage colours, Azalea shirazz has been around for a while, wonderful deep red foliage and naturally lower growing to around 1m, excellent as a feature in a container. Azaleas will grow well in many areas of Australia and are popular in New South Wales and Victoria but grow well from Tasmania right through to Queensland. Azaleas are readily available for sale from nurseries in spring when they in flower, although the best time to plant them is in autumn, while the soil is still warm. They dom prefer a lightly acid soil with a ph of around 5.5, however they are a versatile plant and will grow well in pots and containers as wel l as in the garden. Pruning Azaleas is only required to remove dead or damaged wood and maintain shape, in most years azaleas require little or no pruning at all. The best time to prune is just after flowering when the plants are in active growth, usually in late spring to early summer. Try to avoid pruning in hot seasons and mid winter. Hard pruning is sometimes suggested to revitalize old plants, be aware that this can work, however cutting back into old hard wood needs to be done when plants are in active growth (spring) and can result in dead sections. We suggest light pruning every two years, and a little tidy up after flowering. Azaleas are not frequently sold by mail order due to the nature of the plants.